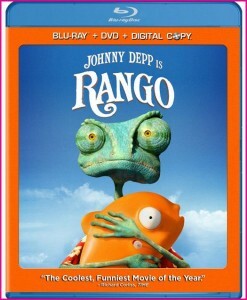 It seems that whatever Johnny Depp touches turns to box office gold these days and Rango is no exception. 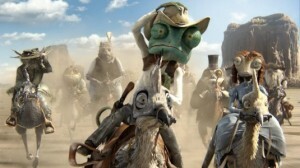 In Rango, we see Depp step seamlessly into a new format in an animated movie. The new format is working for Depp and seen the film become a smash hit with the all-star cast and the sharp and often hilarious script making the movie at once appealing to all the family. 2005: an unlikely time to see a Western being made. Yet this Western comes with a unique twist. 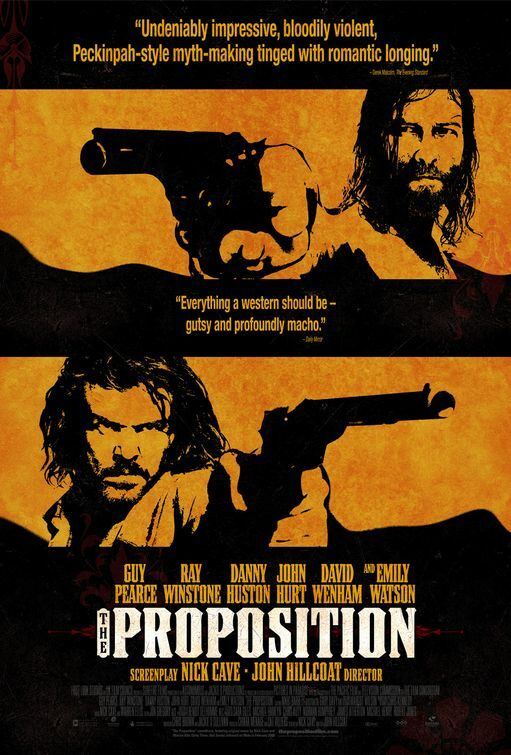 Not having been moved to watch a Western since Clint Eastwood’s Unforgiven in the ’90s, I was excited to watch The Proposition, starring one of my favorite late-90s independent actors, Guy Pearce. L.A. Confidential (1997) and Memento (2000) being two of my favorite films from that era, both starring Pearce, I thought I was in for a treat. 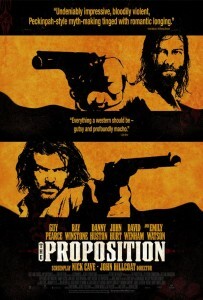 The trailer for The Proposition is also top-notch. And yet, there was just something about this film that didn’t quite make it the masterpiece I was led to believe it was. I’ve been thinking about why this might be for the last three weeks while trying to put together a few paragraphs about the film for this site, and yet it’s still quite difficult for me to pinpoint why I didn’t get this movie. The film is put together very well, introducing new characters at a very natural, fluid and almost seamless pace, almost as if we already knew these individuals and are just stopping back in to check up on them. Not wasting time on introducing who all the characters are, the film gets right to the story of a trio of outlaw brothers – one too young to know the evil of his brothers’ ways, one so evil the blackness seeps out of him, and the last, played by Pearce, stuck in the middle of his innocent brother and his evil brother. As the film proceeds, we find out that there’s been a falling out between the brothers, with Charlie (Pearce) taking his younger brother, Mike (Richard Wilson) and getting as far away from their evil brother, Arthur (Danny Huston), as possible. It’s not long until the law gets its hands on Charlie and Mike, with the gallows waiting for them. The two are basically as good as dead until Captain Stanley (Ray Winstone) makes a proposition to Charlie: find your older brother and bring his head to me, and I’ll let you and your younger brother free. This seems like an easy choice for Charlie, who wants nothing to do with his older brother, until he does eventually track him down and is saved by him after being ambushed and speared by a group of Aborigines. Now Charlie feels indebted to his brother, but at the same time torn between this feeling and the need to kill him to save himself and Mike. After coming clean about why he suddenly came looking for Arthur, Charlie and his older brother scheme to break Mike out of jail. Problem is, they arrive too late, after Mike has been publicly whipped by a townspeople hungry for any kind of justice they can get against the three outlaw brothers.